In a home off of Martin Luther King Jr. Blvd in East Austin reside Scott and Jen Webel, owners of the Museum of Natural & Artificial Ephemerata. I remember visiting the museum when I first moved to Austin, and since then it has remained in the back of my mind as an oddity I wanted to learn more about. Where did all of these weird items come from, and why are they in someone’s home? If some of the items in the museum seem a little strange, it’s because they are. Jen defines “ephemerata” as “something that is thrown out, but is thought to have cultural value and interest later on.” The museum was founded in 1921 by Scott’s great granduncle, Rolls Joyce, Jr., along with Mercury Curie, in order to preserve old forms of collecting, much like dime museums. 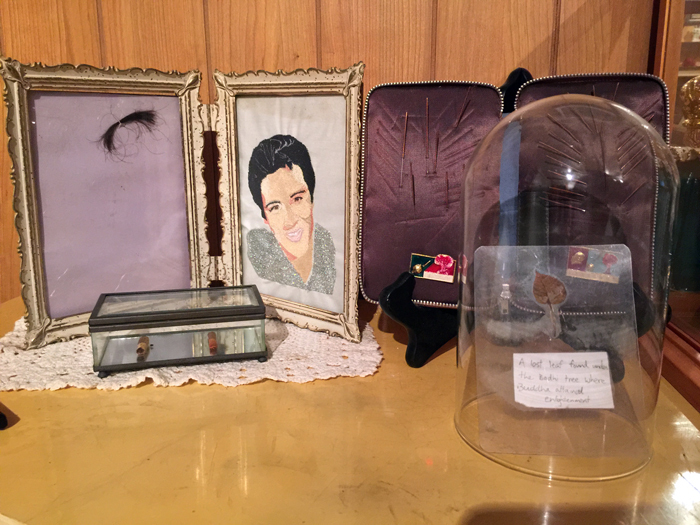 Scott and Jen reopened the museum in Tucson in 1999 after the items were found boxed up in Scott’s grandmother’s shed. In 2001, they moved to Austin and added to the collection while periodically hosting themed exhibitions. Visitors can shelf their attachment to reality to appreciate the more peculiar items, or choose to be skeptical but good-humored. 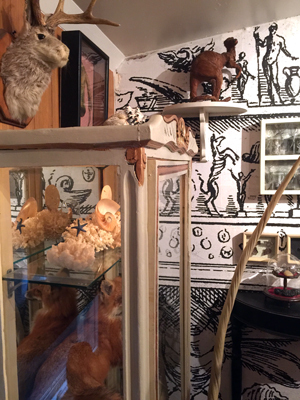 Our tour group turned toward the Naturalia & Artificialia section that serves as an ode to cabinets of curiosity where private collectors would have odd objects organized by symbol or color. Here one can see the head of a flamingo taken out of the American Museum of Natural History’s dumpster. It was once treated with mercury, so it sits behind glass. On one side of the flamingo hangs a jackalope head, and on the other sits a pygmy kangaroo. The “kangaroo” shows the pitfalls of an old form of taxidermy where the skin was removed and reconstructed by someone who did not know what the original animal looked like. Though there are a few taxidermy pieces in the museum, the vegetarian Webels are not going for any sort of shock factor. Everything on display is something they feel good about showing for its fascinating story or place in history. We rounded off the Naturalia & Artificialia section with a look at some of Jen’s favorite pieces. One is anachronistic cutlery, a modern spoon covered in old crystal formations and discovered by miners. This spoon is paired with a fork that was bent by telekinesis. Scott lead us through the items in the Urban Phantasmogoria section, a nod to World’s Fairs and dime museums. He discussed P.T. Barnum’s dime museum where people could see giant crystals, stuffed birds and human oddities. I loved Scott’s enthusiasm as he discussed old fairs and the first Ferris Wheel in Chicago. This 265 foot tall wonder was built to rival the Eiffel Tower, and the museum acquired three rivets from it after it was destroyed in 1906. At this point, I’ll refrain from spilling more information about the objects, so visitors can discover the ephemerata for themselves. When we reached the end of the tour, everyone was still in awe of the items. The Webels have created a space where the past and the imagination can play together. If you’re intrigued and want to visit the museum, check out the main page of their website for open hours, or email or call for an appointment. 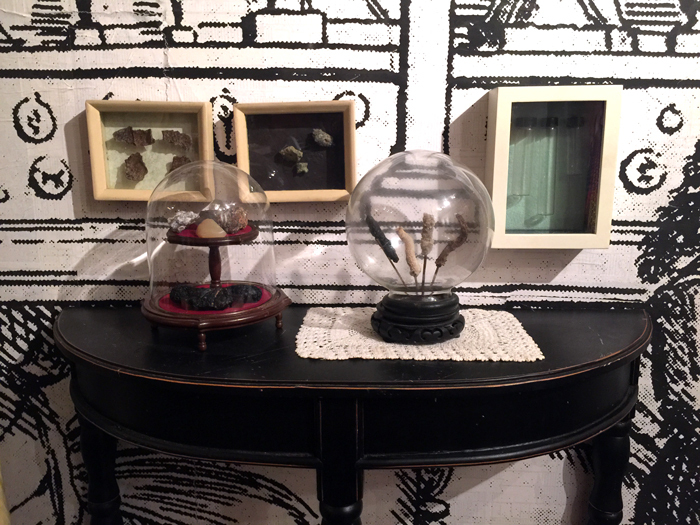 The Museum of Natural & Artificial Ephemerata is family friendly. In fact, the Webels’ children like to help out and show their support. You can show your support by donating $5 per person when you visit. The museum owners don’t actively seek out items, as curiosities seem to find them, but they can’t help but check out antique stores when they travel. They hope to acquire a nice piece of amber with an insect and perhaps a fossilized fairy. Do you own any odd artifacts?